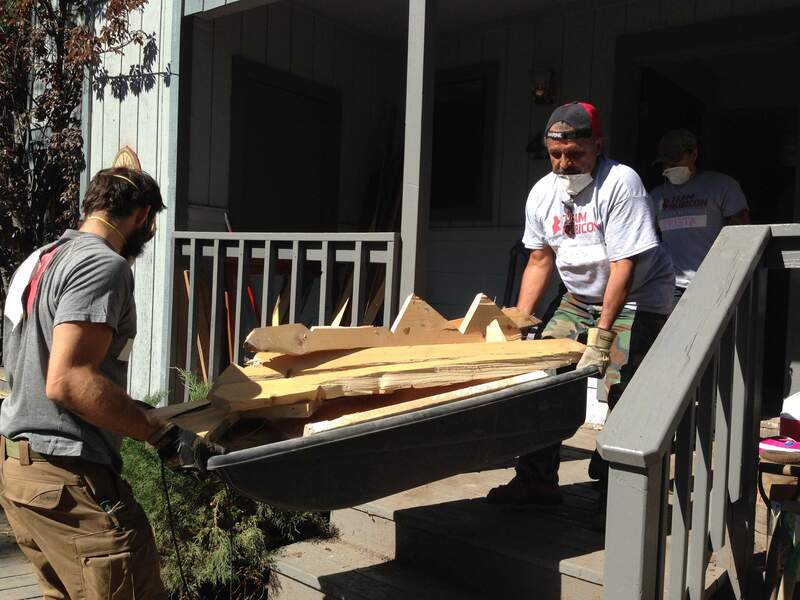 Team Rubicon, a veteran volunteer group that assists with natural disasters, launched its first service project in Durango on Saturday. After heavy rains on the 416 Fire burn scar brought down mudslides and debris flows in July, causing serious property damage to homes north of Durango, there’s plenty to clean up. Organizers with Team Rubicon, a national disaster relief team made up of veterans, is letting Durango know they are here to help. On Saturday, about 15 veteran volunteers with Team Rubicon went to the home of Kaylee and Brian Leidal on East Animas Road (County Road 250) near the KOA Campground. Heavy rains on July 17 and 24 brought down mud that caused significant damage to their home’s interior, which required the replacement of the first floor flooring and drywall. The couple bought their home in April. Looking for help in the cleanup, Kaylee Leidal’s brother-in-law, who is part of Team Rubicon in another part of the country, suggested the couple enlist the help of the volunteer veteran group. The cleanup of the Leidals home is the first service project Team Rubicon has undertaken as the group seeks to better establish itself in Southwest Colorado, said TJ Hermesman, the group’s administrator in Durango. Team Rubicon has about 70 people in and around Durango on its volunteer list, he said. But the team would like to grow that list, as well as its ties with other nonprofits and organizations in the community. For the Leidals’ home, the team mucked out the mud and mess from the first floor so the couple can get it professionally cleaned and rebuilt. Leidal said the couple’s insurance doesn’t cover the damage, so they have been looking for ways to get their home back in order. Their house was the only one in the neighborhood that had interior damage. Hermesman said Team Rubicon also has plans to help more homes further down the road that were damaged by flooding from the 416 Fire burn scar in the next week or so. Crista Casas, Team Rubicon’s Colorado state administrator, said the volunteer veteran group responds to disaster relief projects around the world, helping with fires, hurricanes, flooding and other natural disasters. “We had teams just get off the Spring Creek Fire,” she said, referring to the wildfire this summer in Costilla and Huerfano counties. On top of bringing much needed aid to those suffering from the effects of natural disasters, Team Rubicon also helps veterans readjust to civilian life, Hermesman said. Hermesman served as a Marine from 2006 to 2010. “For me, it was great to get back a sense of camaraderie and brotherhood,” he said. Scott Rushford has served with Team Rubicon for two years. He traveled from Broomfield to help Saturday.